We thought that Saturday the 6th of April might have been leaving it a bit late, but fortunately, with the run of cold weather over the last week or so, our timing was just ‘spot on’! 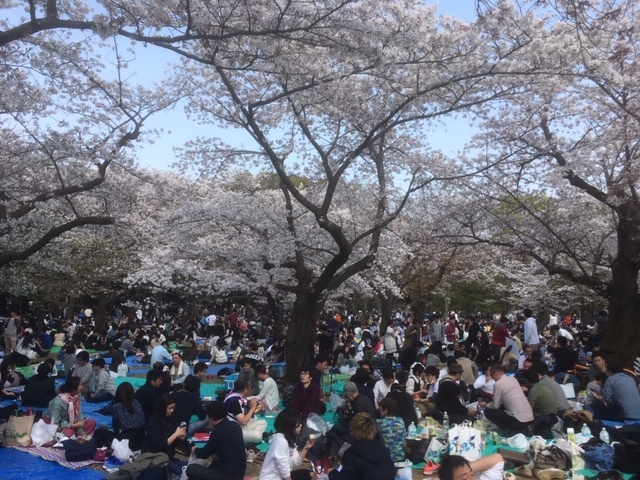 Our annual Hanami party in Yoyogi park was a roaring success, with around 40 players, WAGs, mates, and 1 random drunk guy (wherever did he come from?) in attendance. 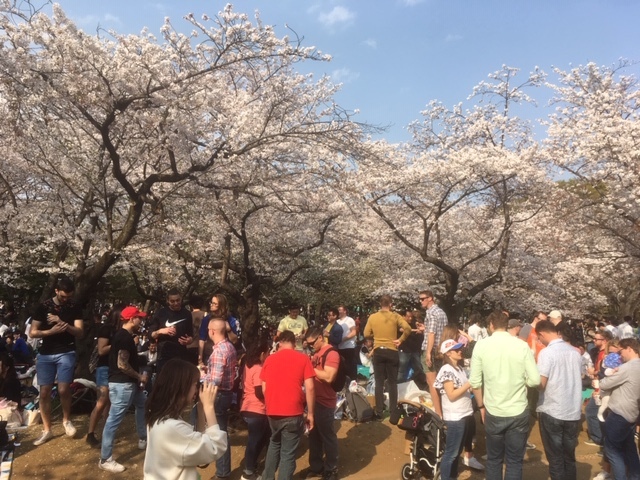 We had a great position, thanks to Gen having arrived early to secure our spot, under a canopy of blossoms, right next to the main path, which was actually most conducive to another type of ‘blossom viewing’; the blossoms walking by were just as interesting as the ones on the trees! The usual mixture of beer, wine, and chuhais were downed over the course of the afternoon. We even had a rather expensive looking bottle of whisky doing the rounds, which incidentally spent an inordinate amount of time in the hands of none other than Frank, who must be congratulated, by the way, on his organising of the event. The petals of the blossoms were raining down upon us whenever the wind blew, with the lucky ones catching them in their cups. There was a complaint from Junki, however, about most of the foreign contingent arriving with bags of alcohol and buggerall food !? (except for Tooley, who brought a cut lunch …. for himself), which was in direct contrast to the people around us all sitting rather nicely on their ‘blue/green sheets’ with copious amounts of food to be eaten by all and sundry. I think Junki was hungry. And anyway, we spent most of the time standing, as we are wont to do when holding a drink in our hand; in the left hand, of course, due to Chris stalking the ‘buffaloes’. From time to time, people disappeared for very long periods of time, only to return looking haggard and needing a drink. Yes, as you can imagine at any event in Tokyo, the lines to the bathrooms were measured in 10s of minutes rather than 10s of metres. People drifted in and out of the group, but we seemed to keep a good number at any one time; we even had Matt turn up with somebody’s dog on a leash (don’t ask… I think it had something to do with being a tad more popular with ladies while walking in a park) With the sun sinking below the horizon, and dusk starting to fall upon the group, we all thought it a good time to clean up, and head to a bar somewhere in Shibuya. What had begun as a rather fun family affair was devolving into a rotating door of chaos. With most of the Cru inebriated or close enough, the gang stumbled into the ever busy Tasuichi. 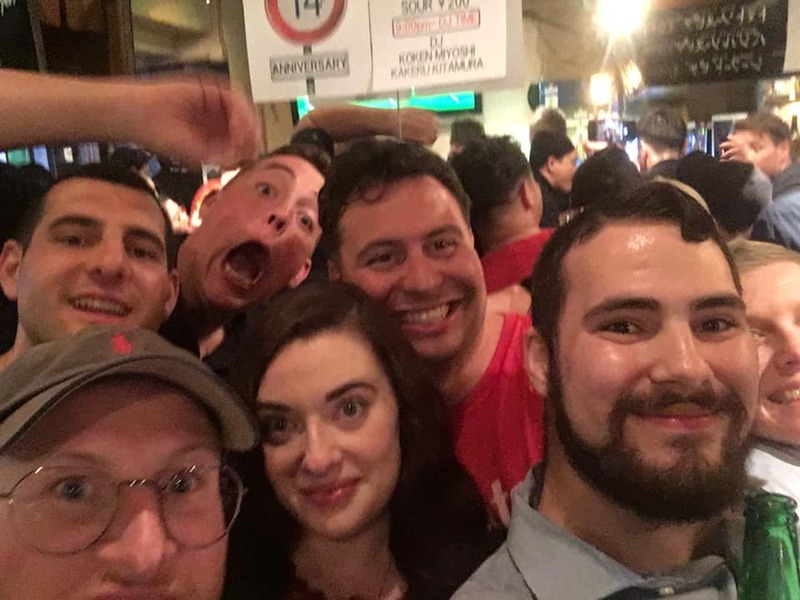 After a certain new member managed to spill half a pint onto another member’s trousers upon arrival, the situation intensified as Corey returned for the last rounds of his good bye. Smiles were abundant and more beers were ordered. With an impromptu Haka and round of shots, the group slit off into the night to pursue other celebrations. The Crusader’s Hanami and Corey’s final event were a resounding success. Until next time, keep the beers cold and the shots full!